For those in the position of building management and maintenance, they’ve got twice the responsibility in one area of their lives that most of us do not: they’ve got to keep two roofs over their heads. In the industrial or commercial setting, the roof — one of the most important aspects of commercial building management — can often get overlooked. In most commercial settings, the roof is one of the biggest investments made on a building and, likewise, it must be maintained beyond most other aspects. For those new to the facility management profession, they may have questions about roof maintenance that need some answering. What is the first step to maintaining a roof? The first step to maintaining a roof is to prevent water from collecting. Next, according to Stinson Services, is removing excess debris from it, including tree seeds, leaf buds, small sticks, branches and falling tree blooms, which can damage shingles, cause algae to grow and eventually clog the gutters. This is especially true if there are trees overhanging the roof. "You should clean gutters and downspouts to prevent leakage and backup. It’s important to remember to clear debris from roofline valleys and other buildup areas. It is always surprising how much can collect and cause an overflowing situation during a rainstorm," the organization says in its blog. What about accessing the roof for inspections and maintenance? Perhaps it goes without saying or is common sense, but too many people and too much weight on the roof can cause roof strain. 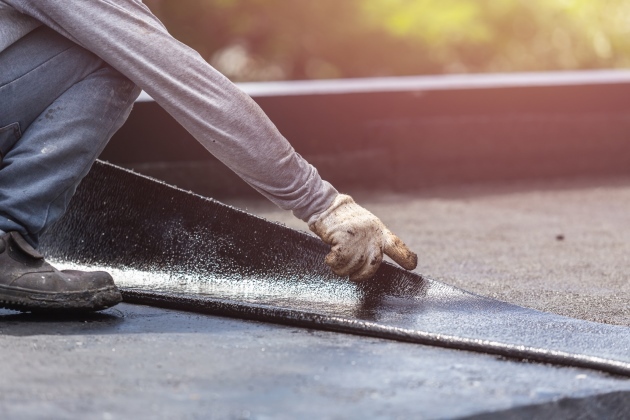 While it’s necessary to get up on it, too much foot traffic on it is not a good thing, and can hasten deterioration, especially with asphalt roofing. How often should the rook be examined for moisture detection? Every five years or as needed. Leaky roofs cost American businesses billions of dollars annually. Damage ranges from minor water stains and electrical outages to complete structural failure of the roof. What about maintaining water removal? Irrigation is required or the roof will likely become compromised. Remove moss and other debris. This can protect the roof membrane from leaks and pooling. Leaving moss in place can damage the roof. Moss can act like a sponge, soaking up and storing rainwater and can cause mold growth and decay. Installing zinc or copper flashing can keep a roof free of moss. As rain washes down the roof some of the metal dissolves and kills the moss. You can apply moss-killing chemicals in liquid, granule or powder form, too. If moss is already growing, a professional can apply a chemical treatment twice a year to kill it. How often do I conduct a roof inspection? Twice a year and after a severe storm is good practice. An inspection can determine if the roof is performing according to its intended function. The National Roofing Contractors Association recommends that roof inspection and maintenance be performed regularly. Additionally, you should check roof-to-wall connections and examine flashings for wrinkles or tears. If the flashings are falling off or rusted out, they need to be replaced. If you’re concerned your roof has a leak, there are other considerations to make. Penetrations are the most common leak sources and will stop the natural water flow off of a roof. Chimneys can be a primary leak source, too, and skylights trap water behind them. Plumbing vents often need to be sealed or painted. Finally, there is the matter of gutters. They are more important than you might realize. They must be installed and sloped properly to drain, tightly fastened and free of debris. More maintenance insight is available through GAF’s technical advisories, which are available to all contractors.